Abstract: Among the variety of complex network metrics proposed, node importance or centrality has potentially found the most widespread application—from the identification of gene-disease associations to finding relevant pages in web search. In this workshop paper, we present a method that learns mappings from node attributes to latent centralities. We first construct an eigenvector-based Bayesian centrality model, which casts the problem of computing network centrality as one of probabilistic (latent variable) inference. 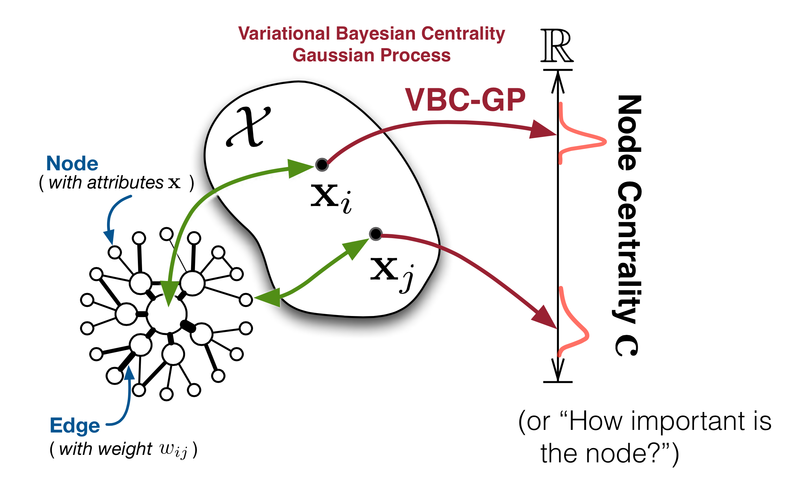 Then, we develop the sparse variational Bayesian centrality Gaussian process (VBC-GP) which simultaneously infers the centralities and learns the mapping. The VBC-GP possesses inherent benefits: it (i) allows a potentially large number of nodes to be represented by the sparse mapping and (ii) permits prediction of centralities on previously unseen nodes. Experiments show that the VBC-GP learns high-quality mappings and compares favorably to a two-step method, i.e., a full-GP trained on the node attributes and network centralities. Finally, we present a case-study using the VBC-GP to distribute a limited number of vaccines to decrease the severity of a viral outbreak. Well, my first working day at SMART is almost over. 4 minutes and 35 seconds to the stipulated end-of-work-day. But who’s counting? So far, it’s been interesting — met the friendly folks here and saw the cool toys (autonomous vehicles). I’m one of the “early birds” and managed to land a desk with a great view of the NUS campus. That said, I might move down to “The Garage” where all the robots/machines are. Hopefully, I’ll sort out all my administration stuff soon and get on to playing working with the vehicles and some new learning methods I have in mind.